Anteater is a common name for the four extant mammal species, commonly known for eating ants and termites. Of the 20 varieties of armadillo, all but one live in Latin America. Armadillo is a Spanish word meaning “little armoured one” and refers to the bony plates that cover the back, head, legs, and tail of most of these odd looking creatures. Remember ‘ Fuleco, the Armadillo’ was the official mascot of the 2014 FIFA World Cup. Fuleco is a three-banded armadillo, a species of armadillo which is native to Brazil and categorized as a vulnerable species. It was portrayed to be cheerful, appealing character widely thought to represent the words, 'Brazil', 'Nature', 'Friendly' and 'Passion for Football'. The mascot, with its message of environmental concerns, the ecology and the sport turned out to be very popular with football teams around the world. Understand that all ant-eaters, need not be ‘armadillos’. .. .. in this beautiful World, can there be something which is allergic to their most favourite food source. Have seen many of my friends perfunctorily order idly whenever they go to hotel for breakfast and some others who could not simply live without ‘curd-rice’ and ‘filter-coffee’ – what about you ? Armadillos have a leathery armour shell. Then there are Pangolins or scaly anteaters, mammals of the order Pholidota also living in Africa. There also are ‘aardvarks’, a medium-sized, burrowing, nocturnal mammal native to Africa. A nocturnal feeder, it subsists on ants and termites, which it will dig out of their hills using its sharp claws and powerful legs. Have not thus far heard of ‘Echidnas’. In Greek mythology, Echidna was a monster, half-woman and half-snake, who lived alone in a cave. She was the mate of the fearsome monster Typhon and was the mother of some monsters of Greek myth. Echidnas evidently evolved between 20 and 50 million years ago, descending from a platypus-like monotreme. Though their ancestor was aquatic, echidnas adapted to life on land !! Now read this interesting report in MailOnline. With bulging, puffy eyes, inflamed skin and bald patches, Matilda the echidna has become a medical marvel. She now holds the title as the world's only echidna – also known as a spiny anteater – to be allergic to ants, which is her sole food source. She first arrived at Melbourne's Healesville Sanctuary as a baby after her burrow was accidentally dug up at a nearby property. So when vets noticed eye and skin changes almost two years later they set to find out what was wrong and the results surprised even the most seasoned campaigners. Sanctuary vet Claire Madden said her allergy was bizarre and the first of its kind recorded in the world. Matilda the echidna has become a medical marvel. 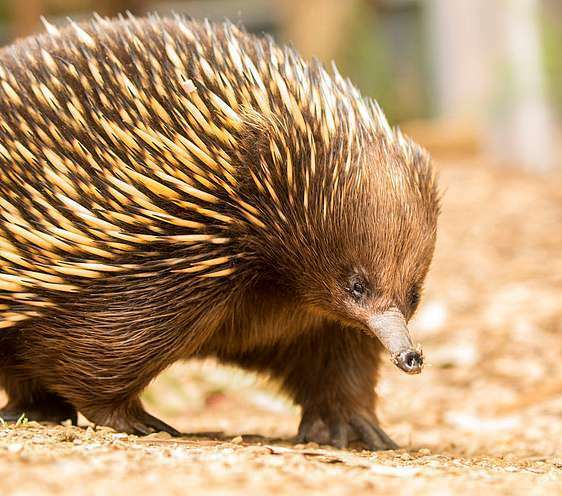 The spiky monotreme now holds the title as the world's only echidna to be allergic to ants - her sole food source. Generally, ants make up 100 per cent of their diet, with some dirt ~ and so understandably we were in a bit of shock at the finding, the Vet added. Without an option of an alternative diet, veterinary dermatologists at the Melbourne Veterinary Specialist Centre developed two vaccines to train Matilda's immune system to tolerate the creepy crawlies. Without treatment, Matilda was at risk of getting a deadly infection or losing her sight. 'We could not remove ants from her environment because that's what they are constantly dependant on to survive nutritionally,' Dr Madden told the Guardian. She first arrived at Melbourne's Healesville Sanctuary as a baby after her burrow was accidentally dug up at a nearby property – and vets had to find a way to remove the allergen without removing it from their diet. It is reported that the three-year-old has responded well to the treatment. She has been vaccine-free for six months and is able to eat ants without side-effects. Matilda lives in an enclosure with a 34-year-old echidna called Snoopy and a koala called Emily. She will be closely monitored by vets for the rest of her life. A female echidna typically has a 20-day gestation period before laying an egg directly into her temporary pouch that develops when she is pregnant and regresses when her baby no longer needs it. The puggles hatch about 10 days after the egg is laid, and stay in the pouch for two to three months. When the puggles hatch they are only 1.5 centimetres long and will travel further down their mother's pouch to get milk ~ at seven months old the mother echidna leaves and the puggles are left to fend for themselves.